Movement and meditation retreats don’t have to be fancy to be fun and transformative. We’re bringing things back down to earth with our Nature + Nurture Retreat. Dawn and Andrew are thrilled to team up to offer you this 3-night/4-day retreat on the lush, organic herb farm of Oneka Elements. Imagine: driving in from the city, pitching your tent anywhere on the 170 acre property, playing by the pond, movement classes in the barn, trail runs on the farm, walks in the gardens, laughing around the bonfire, meditations under the stars, and farm-to-table meals by Blake Mackay. There are yoga mats and cushions on site. Located in the mountains of Sutton, Au Tournant du Coeur is a place specifically designed for contemplation, introspection and regeneration. Being less than an hour and a half drive from Montreal, Au Tournant du Coeur is an ideal location to retreat and renew. Sleeping quarters are equipped with single/twin beds and a work space. 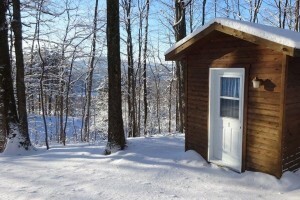 Students have the choice of rooms in the main building (single, double, quadruple occupancy) or outdoor heated cabins (single occupancy). Dawn Mauricio is a yoga and meditation teacher with a playful, dynamic, and centered approach. She is known for her boundless energy, and smiling personality. In addition to teaching yoga since 2006, she has been studying Insight Meditation since 2005, and has completed numerous silent meditation retreats internationally, including a 3-month silent retreat. Drawing from her deep experience in yoga and meditation, she delivers an effective balance of clear, precise instruction and mental reflection. Dawn firmly believes that how we offer ourselves in practice reflects how we offer ourselves in life, inspiring her to find new ways to extend her practice beyond the yoga mat and meditation cushion – and encouraging her students to do the same. Andrew Bathory is recognized for his playful, warm and creative approach to teaching. He is passionate about alignment-based yoga and movement practices and he integrates restorative principles, mindful strengthening, and breath work into his classes. Although his practices as both a yogi and musician have taken him around the globe, he has happily called Montreal home since 2011. These days, you can find Andrew at ELMNT Studio, a boutique spin, yoga, and movement space he co-founded in NDG.